NEW YORK: A peaceful resolution of the Kashmir conflict should be both reflective of the locals’ wishes and be in line with the United Nations statutes, Foreign Minister Shah Mehmood Qureshi said during a meeting with Secretary-General Antonio Guterres. Raising the issue of the plight of Kashmiri people, Qureshi talked to Guterres about the human rights violations in the Occupied region, expressing grave concern regarding the matter. The Secretary-General, he requested, should play a role in the resolution of the conflict. During the talks, the foreign minister also discussed the first-ever report on Kashmir published by the UN High Commissioner for Human Rights that had called for an international probe into the numerous violations. 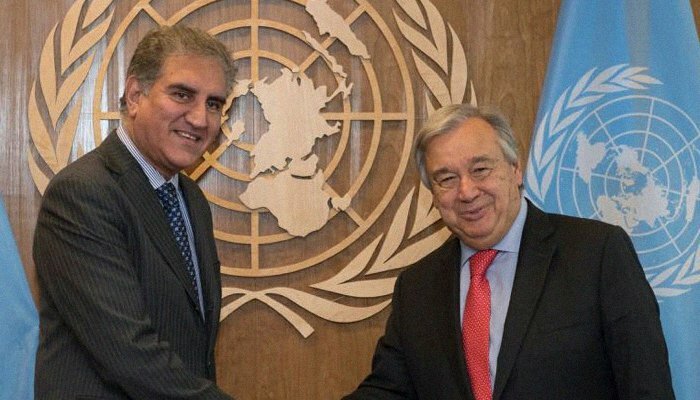 It was important for a potential solution to be in accordance with the United Nations rules and regulations, Qureshi said, adding that Guterres should tell India to stop its aggressive and jingoistic narrative in the region. 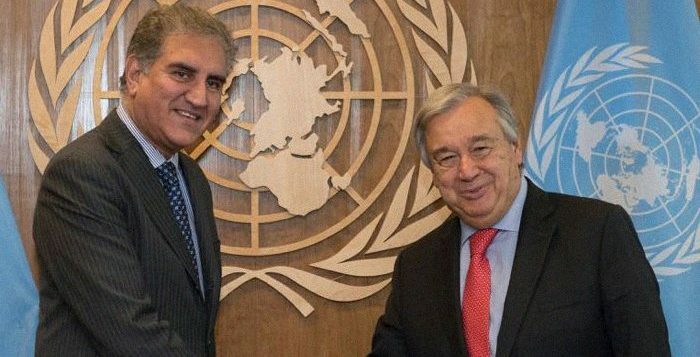 In addition, Qureshi, while terming Pakistan a “privileged partner of the UN”, said he was grateful for his country’s role at the global body and underlined Islamabad’s desire to engage with New Delhi for lasting peace. Separately, the foreign minister also informed the UN chief that Pakistan wished for a peaceful resolution to the Afghan issue. Previous ArticleBiggest Security Breach: Facebook says 50 million accounts hacked!